Just as Omaha’s come of age with performing arts venues, nightlife attractions, community events and public spaces, so it’s matured in cinema. This maturation first bloomed when Alexander Payne made features here. Then the local indie filmmaking scene organized. Subsequently the Omaha Film Festival’s provided an annual juried focus on movies. But the real growth came when Film Streams launched in 2008, thus giving north downtown a vital new anchor and the metro its first year-round dedicated art cinema. Another amenity in the transformed Omaha. More than a showcase Film Streams is viewed as a cultural center that invites discussions around movies and their themes. “I love that there is a place to talk about complex and difficult issues and where I am learning about and appreciating film in a whole new way,” says board member Katie Weitz White. He mentions the documentaries Food Inc. and A Time for Burning as films whose subjects, the nation’s food supply and racial discrimination, respectively, became talking points following screenings. The nonprofit is part of the new community engagement model championed by young professionals here. Perhaps no one embodies that aesthetic more than Film Streams founder-director Rachel Jacobson. The Omaha native long harbored the vision for an art cinema. She enlisted artists, entrepreneurs, community leaders and business experts to help realize it. A classic networker, Jacobson’s built an enviable, pro-active board of directors and advisory board filled with heavy hitters, influencers and tastemakers. Two celebrity players from Omaha, Payne and Kurt Andersen, are more than window-dressing names associated with it. They guest curate series and host the annual fund raiser, Feature Event. The July 22 Feature Event IV pairs Payne in conversation with Jane Fonda. Past Features brought Steven Soderbergh, Debra Winger and Laura Dern. It’s no secret Payne reels in these major cinema figures. The gala’s evolution reflects how Film Streams capitalizes on relationships. “It’s been a collaboration between us and the Holland and each of the different chairs of the gala. The first chairs were Betiana and Todd Simon, the second chairs were Paul and Annette Smith. Last year it was Katie Weitz White and her husband Watie White and the Weitz family. This year’s chair is Susie Buffett. It’s only one night but in that small window Film Streams coalesces everything it stands for by giving film-as-art a big fat community forum. “It’s become this signature thing that’s perfect for us. The fact that we get to bring these world renowned actors and directors to town is absolutely thrilling and the conversations have been I think really meaningful and one-of-a-kind,” she says. Among those varied authors is her father David Jacobson (Kutack Rock), who chairs the board of directors. The board of directors includes members of old-line art philanthropist families. Jason Kulbel and Robb Nansel of Saddle Creek Records and Lyn Wallin Ziegenbein with the Peter Kiewit Foundation are advisory members from different generations, each exerting pull in different segments. The broad-based support Film Streams has received from donors, granters and box office patrons has allowed it to become a vested fixture on the arts-culture landscape in a short time. Paul and Annette Smith support the organization monetarily and as advocates. The couple sponsored Feature Event II with Debra Winger. For film buffs like Sam Walker, “Film Streams has been a dream come true.” Before it the University of Nebraska at Omaha emeritus professor of criminal justice made do with scattershot screenings of art and classic films at commercial theaters and other venues. Documentaries rarely showed. Visits by guest film artists were almost nonexistent. Forget about any discussion or education. The situation worsened when local universities and museums abandoned curated alternative film series. As cineplexes became slaves to blockbusters and sequels, the metro starved for an art film fix. Enter Film Streams. 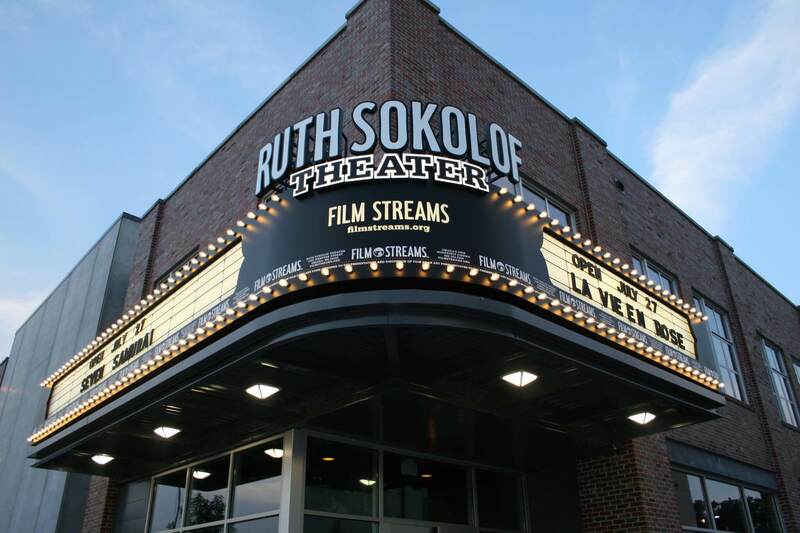 It’s already presented more than 200 first-run premieres and 400-plus classics, shown films from 43 nations and welcomed 222,000 patrons to 700-plus programs at its Ruth Sokolof Theater. Forty-some visiting filmmakers and guests have spoken there. Dozens of panels and Q&As have followed screenings. Guest filmmakers sing its praises too. Louder Than a Bomb documentary producer-director Greg Jacobs says Film Streams “really was one of the favorite stops” on its theatrical tour. “It’s an amazing facility and program. i just got the sense it’s a creative hub.” Jacobs notes what many observers do – that the organization takes its role as catalyst seriously. Film Streams screened the documentaries Restrepo and To Hell and Back and hosted ensuing discussions by veterans and heath care workers about PTSD. It screened the doc The Last Survivor and hosted discussions about genocide. She considers Omaha conducive to doing community outreach. “I think a lot of it’s due to the nature of Omaha and how things operate, how everyone is kind of interconnected in 12 different ways. So we just have these opportunities to link to so many different organizations and individuals who in turn are willing to collaborate. The 100-some partners Film Streams has cultivated run the gamut from arts groups to community organizations and social service agencies to school districts and universities. One partner is the Office of Latino and Latin American Studies at UNO. OLLAS-Film Streams present a biennial Cinemateca series. It returns August 12. “The partnership became an instant expression of these two organizations’ mutual commitment to community engagement and to the broadening of learning opportunities beyond traditional spaces,” says OLLAS executive director Lourdes Gouevia. “We continue to explore ways to encourage the Latino and non-Latino community to experience this great theater and the beauty of Spanish and Portuguese foreign films. All that engagement has a practical side, too. “It has to be that way in order to be sustainable,” says Jacobson, who bends the ear of top business executives.